These are the times we live in: Every step of Montminy’s transition from male to female has been accompanied by a rollback of laws and policies that protect her community. In February, Montminy, of Vernon, was a senior at Southern New Hampshire University. On a goof, she dressed up for a campus drag show. She was floored by how she felt in her body suit and fishnet stockings, and the evening led her to admit that signs of her gender dysphoria—when the gender a person is assigned at birth does not match the gender with which that person identifies—had been there for years. 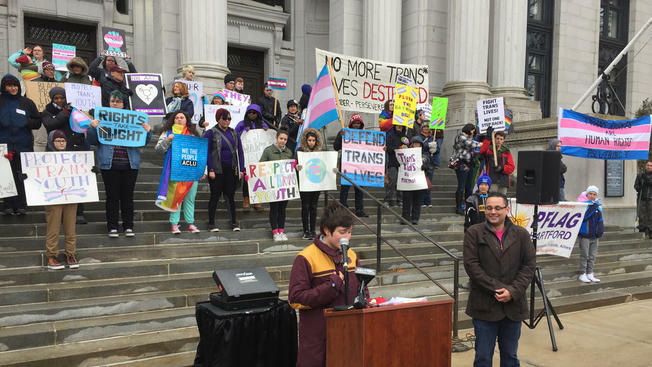 Dozens recently gathered in New Haven to protest a rollback of laws and policy to protect the transgender community. The month of the drag show, the federal Department of Education announced it would no longer hear complaints or take action when a transgender student requests the right to use the restroom that matched their gender identity. A recent leaked memo said the administration intends to push for a narrower definition of gender. The Department of Health and Human Services is, according to the New York Times, “spearheading an effort to establish a legal definition of gender” and change Obama-era policy so that the landmark legislation Title IX prohibits discrimination based on gender, not gender identification. The Obama administration had ruled the exact opposite. A month after that announcement, in March of this year, the federal government announced new restrictions on transgender members of the military. The hits just keep on coming, according to the National Center for Transgender Equality. In August, the federal Department of Labor issued a directive that said federal contractors and subcontractors should take into account their religious beliefs when dealing with employees. This could mean that if someone’s religious beliefs do not accept gender dysphoria, a transgender employee could be fired. The administration rolled back protection for transgender prisoners in May. In all, it’s an astounding series of rollbacks that leaves Montminy and other members of the transgender community vulnerable. States and municipalities have been fighting back. In February 2017, after the Trump administration began to roll back protections for transgender students, Connecticut Gov. Dannel P. Malloy signed an executive order to protect transgender students in the state. In 2011, Malloy signed a law that prohibits discrimination based on gender identity or expression. According to the ACLU, 18 states and the District of Columbia have some kind of anti-discrimination laws that protect transgender people. Nearly 200 cities ban gender identity discrimination, and governors in five states have signed executive orders that protect state employees who are transgender. But the attitude from D.C. is scary, said Montminy, a substitute teacher in Manchester with an eye on grad school. Since she’s started the transition, she has yet to use a public bathroom for fear of a confrontation—or worse. One day, she hopes to overcome that fear. One day, she hopes to have gender reassignment surgery. One day, she hopes that being a member of the transgender community won’t be that big of a deal.